Muhammad Ali Enterprises announced that the world’s all-time greatest heavyweight boxer, timeless cultural icon and international legend will take up residence in Los Angeles starting Nov. 2 with an official, limited engagement exhibition titled, Muhammad Ali: The Greatest of All Time. The exhibit will open its doors at the newly renovated Beverly Center, running from Nov. 2, 2018 to Jan. 20, 2019. Tickets are limited and on sale now. As the first of its kind in Los Angeles, the in-depth and illuminating exhibition will feature a wide array of rare Ali-owned and themed memorabilia. Expertly curated, the exhibition delves into Muhammad Ali’s evolution from hometown hero, The Louisville Lip, to becoming one of the most recognizable people in the world. Rare photos, footage, artifacts and information will spotlight Muhammad Ali’s life both inside and outside the ring from his early years, the Olympics, to his dedication to the civil rights movement, his brave health battles and everything in between. The collection will include championship belts, event-worn robes, shorts and boxing gloves, Olympic medals and torches, and original posters, magazines, ticket stubs and programs, from as early as the 1960s. The exhibit provides a vivid snapshot of the Muhammad Ali Center, which was founded by Ali and his family in Louisville, Kentucky. In addition to the viewing the artifacts, visitors can experience and share Ali’s unique story as they navigate memorable, immersive photo stations and multimedia displays. Muhammad Ali: The Greatest of All Time chronicles Ali’s persona outside of the sport, highlighting his goodwill missions across the globe, run-ins with other celebrities, and of course, his clever and often colorful prose and pre-fight theatrics. 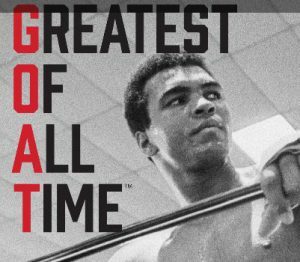 Muhammad Ali: The Greatest of All Time is scheduled to open doors on Friday, Nov. 2 at 10:00 a.m. The space will be open Mondays through Fridays from 10:00 a.m. to 9:00 p.m., Saturdays from 11:00 a.m. to 9:00 p.m. and Sundays from 11:00 a.m. to 5:00 p.m.
Tickets are limited and on sale now for $12 per person. To purchase tickets or learn more about the exhibition, fans may visit Ali.CircleExhibits.com.